HEARTS would compete strongly in England’s Championship given the opportunity, according to midfielder Don Cowie. The 33-year-old spent seven years in English football and believes his new club would be pushing high in the second tier having been revitalised since summer 2014. Ann Budge’s takeover breathed fresh life into the Tynecastle club when they emerged from administration and they have since gone from strength to strength. They sit third in the Ladbrokes Premiership and are aiming to reach the Europa League qualifying rounds this summer. Signing former Scotland internationalists like Cowie during the January transfer window underlines their prowess. The midfielder played in the Premier League, Championship and League One in England during spells with Watford, Cardiff City and Wigan Athletic. 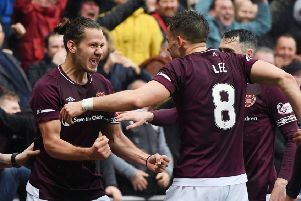 He is confident Hearts could reach the Championship’s upper echelons given their fanbase and playing squad. “They would definitely be in the Championship and pushing to get higher,” said Cowie. “You come here and Hearts have sold out their last 12 or 13 home games. That’s phenomenal. I was at Wigan, who were a Premier League club three years ago. Now they get 8,000-9,000 at home games if they’re lucky. When you put it in that perspective, this is a great league to be in. Amongst those attracting attention at present are a group of Hearts youngsters who have made the transition from youth academy to first team. Callum Paterson, Sam Nicholson, Jamie Walker and Jordan McGhee are being monitored by English clubs seeking another cherry ripe for the picking up north. Having represented Scotland ten times himself, Cowie knows they have the attributes to win full international caps. Gordon Strachan will name two different squads for next month’s friendlies against Czech Republic and Denmark and several Hearts players are challenging for a call-up. “Watching from afar, I was aware of some of the talent in the Hearts squad,” he admitted. “But now, seeing it close hand, the club is in a great place - and Scotland, as a whole, is in a great place. Sam Nicholson, Jamie Walker, Callum Paterson and Jordan McGhee are really fantastic young players who are playing at a great level week-in, week-out and that can only be good for Hearts. “I think they need to have those [international] aspirations. Callum has already made that breakthrough by being in one of the squads and really needs to push himself because there is probably a gap there if he is determined to take it. He has great attributes and could go on to be a top player. The other boys are no different. If they really want to dedicate their lives to football then these are the rewards they could get. Cowie intends to do everything in his power to help the players reach their full potential. To do so, he will tap into his own experiences of growing up and trying to forge a career in football. “When I was at Ross County in my first two years as an apprentice, I probably came across 30 or 40 players. I don’t think there’s any of them playing football. The number who probably thought they were better players than I was will be in double figures but, for whatever reason, I knuckled down. I gave it everything I could, doors opened and I got fortunate.